No pictures exist of the interior of the library in the Broerklooster. 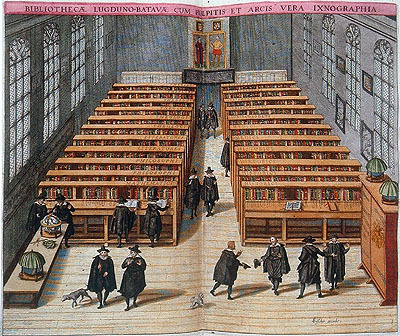 For an impression of how it may have looked like reference is often made to the famous engraving by Willem van Swanenburgh of the interior of the Leiden university library in 1610, though this is not a faithful rendering of the Leiden situtation at that time. 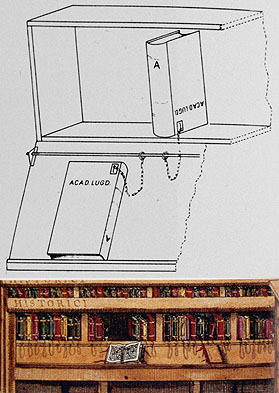 The Leiden engraving shows the books in bookcases, so-called 'pulpita', which doubled as reading desk. The width of similar cases in Groningen has been reconstructed from the width of the books that filled a shelf, based on the shelf marks in the catalogue. This results in a total length of books in each case of 2-2,1 m. Considering the weight of the books these must have been divided over at least two shelves, with a width of at least 30 cm. Because of the folio format of the books the distance between the shelves was at least 45 cm. The library was set up in a long and narrow space, about 30 m long and 3,90 m wide. At first the books were divided over eight presses, which were probably placed at a 90 degrees angle with the windows. As in most contemporary institutional libraries, the books in Groningen were fastened to the cases with chains. Traces of clamps, such as nail-holes and impressions of metal plates, are visible on many bindings. The books had to be consulted on the spot. As in Leiden (unlike the representation on the engraving), the books were placed spine forwards and upside down. To consult them, they had to be turned over onto the desk. The chains were fastened with a ring to a rod, which in its turn was bolted with a padlock. The archives contain several invoices for the acquisition of material for making chains and rings. Apart from the approbation by the Estates in 1631 for making a table, a bench, and two 'pulmts' - probably pulpita - little is known about the furnishings of the library. In 1668 the Town Council presented some books as well as a celestial and a terrestrial globe. Scientific instruments, globes, and portraits were part of the usual furnishings of a library. As in other university libraries, in Groningen the most precious books were kept in a special cupboard (Lat. scrinium). The printed catalogue of 1669 proves that the manuscripts written on parchment and the Christmann collection - the oriental manuscripts - were stored 'in scrinio'.